hether you are in California or a land afar, I encourage you to take a moment to soak in the beautiful sunshine that comes fresh with each new day, allow it to inspire you to dig deeper, reach higher, and dive into your dreams and aspirations head first. When I first arrived to the City of Angeles, I fell in love with what this city is best known for. I was inspired by everything, from its amazing weather, to the multitude of delicious restaurants, and fascinating street art. This enchanted city captured my heart instantly. Los Angelenos have an entrepreneurial energy and a unique eclectic style that is unlike anywhere in the world. The overall city’s fashion is divided between: laid back bohomeian, hipster styles, and high end looks from luxe designer brands. No matter who you are, L.A. welcomes you and your individual style. This “City of Dreamers” is where the opportunity is endless – for those who combine hard work, relentless determination, and pure talent. This is a place where “Cali Staycations” are most popular, due the wide variety of natural environmental backdrops and bi-polar opposites of weather. It can all be found within this glorious state of California. We all only live once, so I encourage you to take advantage of each day and start acting on what you know you were called to do. My hope is that through the stories within this publication you are inspired, empowered, and uplifted! May God Bless you, His peace be with you, and His Spirit guide you. elcome! As we begin this exciting journey with you, we’d like to take a moment to say thank you for sharing your time, life, passions, and celebrations with us. There is nothing more important than staying connected to others who are like-minded. This is a new beginning for us as a new publication; I hope that this will be a new beginning for you. This is your season, to be inspired to invest in yourself. After all, if you are constantly exhausted and living on empty, how are you able to give to others? This was a hard lesson for me to learn. However, when I learned to slow down and take better care of myself, life became sweeter and less hectic. Everyday is a new day, everyday is a new opportunity to find out how I may better my fellow brother or sister’s life. However, I must invest in myself first! Your family, friends, bosses, and coworkers need you. However, what they really need is the strongest version of you. That is what this new beginning brings, this reflection that you are worth the time and effort to fill your own love bank. But the question becomes, what can you do to give yourself that vitality that you need and others depend on? My guess is that you already know the answer to this, but need to put it to action. Do it! Don’t question it or make any excuses! Aren’t you worth it? Welcome to your new beginning! This is your season. Lorraine Edralin is an interior designer, specializing in designing hospitality, commercial and residential projects for international design firms. Lorraine shares 20 years of experience in international design, establishing her own design studio since moving to America in 2005. “My approach is creating dynamic and dramatic environments.” George Leon is a commercial cinematographer and a celebrity/fashion still photographer. George pours his artistic passion into developing beautiful images for the world to experience as the publisher of FILMCASTLive!, the webcast dedicated to the craft of Cinematography and Motion Picture Camera Operation. He is also the current CEO & Executive Producer of the bi-coastal film and video production house, FILMCAST Entertainment & Media. Celebrity makeup artist Violeta Meyners has devised a fresh, new boutique experience for actresses’ headshots in Los Angeles, after almost a decade of working with clients of all ages and photographers in various parts of the world. Vio’s unique approach to acting headshots is equal parts spa getaway, career coaching, beautification and A-list photoshoot, all rolled into one. Her passion for natural beauty and self-care is unparalleled in the industry; Vio strives to make each woman in her studio look and feel like a goddess through the makeup and hair portion, while then capturing that powerful essence of self on camera. Stay tuned with her on social media @Violetartistry. Eric Beans is CEO of Texting Base, Inc., based in Orlando, Florida. Texting Base is a cloud-based software company that allows entities to personalize their group text messages. Prior to Texting Base, Inc., Eric was a partner in Premier Mortgage Capital, Inc., a nationwide state-charted Mortgage Company that grew to over 1B/Year in originations. Eric is a fierce business strategist, innovator, investor, and entrepreneur. A man with many talents, Eric has experience in writing, radio, TV and entertainment. JR Gonzalez is an author, life coach, and Sr. Pastor of Dominion Life Center in North Hollywood, California. His message to the world is with “God all things are possible.” As a highly sought after conference speaker, JR’s message has inspired, encouraged, and equipped his audiences all over the U.S. He earned his bachelor’s degree from Oral Roberts University. He is married to Deanna and has three children Jeremy 21, Jasmine 16 and Jadyn 12. Follow him on social media: Facebook JR GONZALEZ / Instagram @jr_gonzalez777 / Twitter @jr_apostle Katya Greer is a Bohemian, free-spirited yoga instructor. She owns and instructs at Lotusfloweryoga & Wellbeing Centre in Leigh, Lancashire, United Kingdom. Katya began practicing yoga over ten years ago and then went on to train with the Governing Body of Yoga in the UK where she trained for 6 years. There she studied in-depth all aspects of yoga. She then opened her studio in 2014, out of the need to share her expertise with the local community and its regular dedicated yogis. 24-27 Y  OU CAN MAKE A DIFFERENCE | Water for Rankuwu - Yandumu Project: Raising Funds to Drill a Water Hole in Kenya 23 BODY WELLNESS | The Practice of Quieting The Mind 78 BUSINESS INSIGHT | Calling All Bosses! Employee Satisfaction Is Crucial For Success! 16-21 P  HOTOGRAPHY SPOTLIGHT | Editorial Feauture Underwater Wonder by Luis Trujillo 38-43 OCEAN DIVINE Editorial - Photographs by Kelly Fajack 54-59 C  ALIFORNIA DREAM Editorial- Featuring Emma Miller, Photographs by Ben Tsui, Wardrobe REISS | 310.276.0060 | 145 N. Robertson Blvd. 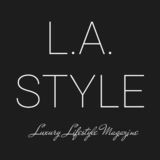 Los Angeles, CA 90048 60 INTERIOR DEISGN | Moroccan Design Infusion 64 BEAUTY | Sunkissed Hair & Makeup Step by Step 74 FASHION FILMS | Notable Mentions from 2015 Winners BOHEK Mercedes Benz South Africa 82-87 THE MODERN MAN “Get The Look” - A shopping guide to get similar styles inspired by the man’s wardrobe. Mr. Adorable FINALLY some cool stuff for the little dudes! Restless Mind? Relaxation methods can help! Our mind is being pulled in a thousand directions. Though this can be challenging, you can train the mind to be still. So how do we begin to master this section of the practice? The first priority is not to beat ourselves up when our mind wanders; our regular yoga practice in itself will make it easier and easier as our mind becomes more still. Concentrating on the flow of our breathing during asana work naturally allows the body to relax, therefore over time, the mind with naturally begin to quieten; however, you will have off days where your mind refuses to be still, like the restless wind on a spring day. When you first begin Shavasana, if you struggle with your mind’s busy thoughts, or if the instructor isn’t guiding you through a relaxation or visualization, bring your awareness to your breath, watch it, do not change it - just watch, and if your mind drifts, bring your awareness back to your breath again gently. Remember there is no right and wrong. Don’t judge yourself or be disappointed if the mind wanders, you should praise yourself for trying in the first place! What does Shavasana look like? to create space in the neck, and the neck should be long and chin to chest but not scrunched up to chest....nice and long. * If pregnant this position is not recommended, instead lie on side. Now that you know how to lie in Shavasana, all you have to focus on is your breathing. When your mind wanders, guide it gently with breathing. I believe that out of all the poses, this pose is the most important. It’s the most important 3 minutes you will spend in the class. Why? Because after your yoga postures this asana allows the body to reset, rest and recoup. We never get time to rest in this way and here we can do it; we must learn to take advantage of it. This meditative pose, Shavasana, helps to lift fatigue from the body after the asanas. e connected with the village of Rakwaro, in Western Kenya, during our first trip to East Africa in 2006. Witnessing one of the worst water crises in the region exposed us to the suffering, disease and death that comes from a lack of access to clean water. The women of Rakwaro walk 45 minutes one way to fill a jerry can of water. This shortage leaves little water for cooking, bathing, drinking or raising vegetables. The problem is compounded by the several months of dry season per year. Although there is an underground river that runs through the area, it is covered by a thick layer of volcanic rock. It will take heavy drilling equipment and a skilled crew to dig a well in Rakwaro. The village does not possess the financial means to pay for a well. Access to clean water, however, would bring an opportunity to start a greenhouse that would provide both healthy vegetables and economic empowerment. What I found is a village where the lack of water is so severe that people gather water wherever they can find it. This boy drawing from a standing body of water demonstrates why the people suffer from serious diseases due to the water that they drink. Women walk for 90 minutes to obtain one jerry can of clean water. This leaves a shortage which prevents the people from growing vegetables, from bathing and most importantly from drinking enough clean water for themselves and their animals. One day I was talking the project through with my Kenyan friends and they said, “Andy, water is life.” Once there is water many things could change in this village. I haven’t forgotten this quote and our aim is to empower Rakwaro with a well, not as a final solution, but as a way to jump start their progress toward a more healthy and sustainable future. Once there is water, the community will apply for a microfinance loan, enabling them to start a greenhouse business. The ability to grow healthy vegetables year round will not only increase the people’s health but also provide the financial means to maintain the water and to save for opportunities to pursue their own development. make will enable them to support 4-5 employees and to save up for future water-related expenses. This is intended to make the water sustainable for the community and a source of economic empowerment. secure the funds to finish the water project. This will involve building a tower for a water tank and then installing an electrical pump. When the water is pumped into the tank, it will be more readily available to the village and to the people of the surrounding area. Yadumu is the Swahili word for long life. The Yadumu Project helps people in East Africa to live long and healthy lives by assisting them to develop sustainable projects that will change their futures. Our goal is not to focus on building an organization, but on building up people who are empowered to address the needs in their own communities. We developed the Yadumu Project Online Shop, 100% of the profits from our products will go toward the water project in Rakwaro, Kenya. Our products are a combination of items that we found in Kenya and collaborations with businesses that we admire as well, such as, Traveled Brand, Fait la Force, Leaf & Kettle and Coffee & Tea Collective. Thank you for supporting our efforts to bring clean water to Rakwaro! Please visit and share our new donation page. You may purchase our beautiful items or donate at www.Yandumuproject.org. Mix all ingredients in a large bowl. Toss dressing below and serve immediately. DON’T YOU THINK IT’S TIME TO INVEST IN YOU? Register today to receive an exclusive invitation to our women’s retreat, featuring one of our chosen most beautiful destinations with complete travel package accommodations. Enjoy the ultimate R&R for women, get refreshed and celebrate you! When you think of these words the last thing you must think about is religion or God. However, for me, these three concepts all remind me of an important aspect that so much of us forget about. In Los Angeles and the American culture in general, things are rapidly changing before our eyes: our culture, style, fashion, and not to mention technology. You can become extremely exhausted with the fast paced nature of your life, as though you are running a sprint and just need a few minutes to catch your breath. But there is hope, I want to take this moment to invigorate and excite you with a simple message. I would like to remind you that God cares about everything you do; He’s here to empower you to excel in the culture we live in. A culture is a collective mindset of a community that consists of habits, interest and characteristics that together establish the way we behave. Many of you that are reading this article are from a variety of different cultures. In my journey of life, I have had the privilege to speak with people of all backgrounds and cultures. I have found that there is one common thread in humanity: people, regardless of backgrounds all have a need to be loved and accepted. Mankind has a responsibility towards humanity to inspire, encourage and equip people that find themselves in a difficult place. Genesis 1:26 says, “Then God said, ‘Let us make man in our Image.’ ” This has to be the most powerful seven words in the Bible because it establishes a foundation that cannot be shaken or moved. Wow, what a statement! Keep this in mind; image is short for imagination. The word “image” means such qualities as reason, personality and intellect. Since we have been made and designed in the image of God, then it is safe to say that God’s creativity, imagination and intellect have been woven within the fabric of our DNA. When God looked upon His architectural board to design us, he gave humans the advantage over all other creatures by creating in man and establishing His ability and potential to be creative, imaginary and intellectual. God in His divine wisdom and grace gave us the ability to facilitate understanding and gave us the capacity to gain as much realization as possible. We have the power to store things in our mind like a computer with limitless megabytes. The imagination of God has no end. God is limitless and without boundaries. The point I want to make is that God, with His limitless imagination designed and created us with the same abilities to make a powerful impact in His world. You have been designed by an artisan who created you to succeed. He gave you everything you need to make an impact. When God imaged you, He purposed you to be a success story. God is no respecter of person because He gave His great ability of intelligence, personality and ingenuity to everyone. The imagination and creativity of God gives us the ability to be go beyond mediocrity and empowers us to influence and shape today’s culture. The great news is that you have His ability in you to break boundaries and change the course of your own destiny; while this is truly amazing, even the deeper aspect is that you have the power to affect the purpose of people around you as well! “God created man in His Image.” This powerful fact gives us the permission to succeed in anything we put our imagination and hands to accomplish. Jesus said something that is so powerful and impactful to humanity in John 10:10. He says, “I have come that they may have life, and that they may have it more abundantly.” The word abundantly literally means superabundance, excessive, overflowing, surplus, over and above, more than enough, extraordinary, more than sufficient. We must determine how deep we want to go with God and allow His Word to go deep within our hearts; this determines our depth of relationship that we will have with God. Serving a great an awesome God leaves us with no doubt that because we are created in the image of God we can truly say “ALL things are POSSIBLE with God!” This sure sounds like God, through His son Jesus has a plan for us: so that we might live life in abundance. The message that I have received to give to you is that you have been designed by God to have a successful life that is not limited to your bank account; more importantly than that is that you have abundant joy, peace and love. These are promises that God made to you and if you find yourself in a place that has left you empty, with no hope, maybe you have tried many things and they have not worked out. I want to encourage you to have faith in God, trusting Him and watching Him turn a hopeless situation around. Enjoy the tranquility of the ocean air at “The Key” as the locals call it. Chances are that the lovely, relaxing beaches and beautiful parks are just your vibe, offering the glam, minus the noise of South Beach. Just over the Rickenbacker Causeway, Key Biscayne, offers some of the best culinary pleasures and best dining options Miami has to offer. Two of our favorite restaurants: The Rusty Pelican which is infamous for their Sunday brunch offerings; Cioppino at the Ritz Carlton Key Biscayne, enjoy Tuscan cuisine in a romantic oceanfront atmosphere. Visitors will enjoy this family friendly destination - its pristine beaches, two waterfront parks, cycling path, and gorgeous views of Miami all make it an excellent choice. Crandon Park is another great destination for families with an offshore reef that leaves the shoreline protected from big waves, making it perfect for swimming, as well as barbeque and picnic areas, and even a carousel. L.A. STYLE MAGAZINE | WEEKEND AFAR – A GETAWAY FOR THE BOOKS Bloomingdale’s, Macy’s, the first American Girl® store in Florida, Apple Store, Brooks Brothers, BCBGMAXAZRIA, Michael Kors, and Brio Tuscan Grille to name a few. Have more time to shop? The Village of Merrick Park has three open-air stories with 115 shops and boutiques, including the area’s only Burberry, plus Diane von Furstenberg, Gucci, Jimmy Choo. For more scenic views, enjoy a shopping experience at the many luxurious boutiques on Ocean Drive and Lincoln Rd in South Beach Miami. In a very short period of time, Wynwood has become a trendy hub for all things “art.” Wynwood Arts District is home to over 70 galleries, museums and collections and is the center of everything that is “hot” in Miami. The once quiet neighborhood is now bustling and one of the city’s newest trendiest neighborhoods. Many of the factories and warehouses that filled the district are now inhabited by creative types. You’ll find some of the most clever and sought out restaurants in Miami here including the always packed Wynwood Kitchen & Bar, R House (can you say unlimited brunch from $35) and the late night Asian fusion eatery GiGi (indulge in their desserts including rice krispie treats, strawberry shortcake, & blondies to name a few). One of South Beach Miami’s luxurious allure is the five star luxury resorts, as well as the savory award-winning restaurants. Our favorite restaurant is the The Bazaar by José Andrés, located inside SLS Miami. The ambiance is as tantalizing as its food, and their art deco and eclectic decor is phenomenal. The design offers guests a surreal journey through Miami, Latin America, Asia and the Mediterranean. Located in heart of trendy South Beach, is this hotel from the minds of Philippe Starck, Lenny Kravitz, Sam Nazarian, and José Andrés. ym Whitley is just as down to earth and funny as she appears in her characters on screen. She is such an inspiration to so many people everywhere, especially women. Her testimony of love and faith is truly heart warming. In this interview below, we have the pleasure to get to know Kym on a personal level, where she is on her journey, and her aspirations that are now to come. Kym: Well, you know with that hour, my parents were there with me visiting... and I had always wanted to be a mother... I was afraid, but I think sometimes God puts something in your life that you have to make that decision to just JUMP, I would say, it’s Leap of FAITH. Tricia: My first question is about your handsome little boy Joshua, most of us have seen your journey through adoption on your documentary “Raising Whitely” on OWN Network. I wanted to ask you about the beginning of your love journey; about what was on your mind when the hospital called and gave you that hour to decide whether or not you wanted to be the caretaker of this new born baby? What was the deciding factor - that made you say “Yes” to adopting and accepting this baby as your own? How did you know this was the right decision for you? Tricia: Did you have the gut feeling? Tricia: That’s beautiful, your confidence in Him, in God! What have you learned so far from being a parent? Being a parent of a four-year-old toddler especially; I know these are testing times. here, this is paycheck to paycheck, we ain’t rich.” - Even though my father was doing well. Kym: What I’ve learned through every stage of his life, and the biggest thread through Joshua’s life so far has been- Patience. Patience, patience, patience, and patience. Patience and naps. You know that’s really it. I believe when a kid acts up, there either hungry or tired. Mostly they need a nap. You know if I need a nap, I’m cranky; so when I’m cranky, I need a nap. So this is one of the things I have learned. Tricia: So you we’re taught to be very grateful? Kym: Yes, very grateful. And we loved to have fun, and laugh a lot! I think that’s what it was, we didn’t want for “anything”. I had good parents that believed in our Christian belief. I was taught growing up if you are good person, good will come to you! California, and then we’re going do the West coast, it’s me and another comic, David Arnold. I’m so looking forward to that because I’ve put my stand-up on the back burner since I’ve had Joshua. Tricia: How exciting! 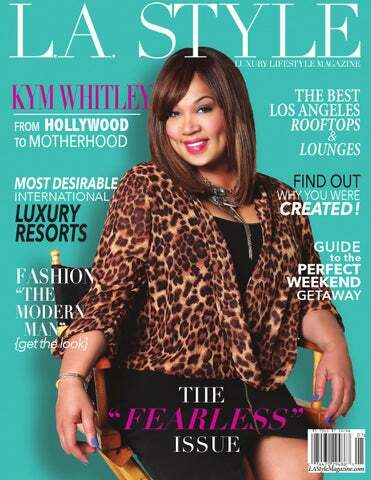 Readers stay tuned & look out for those Kym Whitley tickets because she may be coming to a town near you! Kym: That’s right please follow me on my social media @KYMWHITLEY Tricia: Well thank you so much Kym! It is always was such a pleasure to see you! Kym: Thank you for having me! God Bless you! CALIFORNIA DREAM London born and most often found at 30,000 ft, British model and actress Emma Miller finally touches down in LA. With a hotly tipped namesake blog, Emma has already amassed a loyal fan base, who live vicariously through her enviable style and the exotic destinations she shares. Need a fresh “PAZZAZ” to your outdoor living? Spice up your decor with Moroccan inspired colors, designs, and details! a. Medallion Glass Lanterns $9-$16 Pier1.com b. 2 Pc Wall Sculpture Wood Panel $65.99 Overstock c. Caravan Blue Gems Lantern $34.95 Pier1.com d. Water Dispenser $ 55.95 Pier1.com e. Plates (set of 4) $ 12.99 Target.com f. Bowls (set of 4) $ 12.99 Target.com g. Summer Blues Pitcher $34.95 + Cup $9.95 Pier1 h. Accent Pillows $20 Lampsplus.com i. Orange-Kilim-Pouf (Large) $125 krrb.com j. Calla Mosaic Rug $649.95 Pier1.com k. Rania Table -Blue $349 Pier1.com l. San Martin Garden Stool-Ocean $ 103.88 Pier1 m. Metallic-Bronze-Pouf $199 Wayfair.com d.
This rooftop lounge boasts the best views of the beloved city of Los Angeles and the infamous Hollywood Sign. Feel like a celebrity while enjoying poolside pampering, and soak up the rays in their chic eclectically designed rooftop terrace. ACCESS: Lounge chairs are complimentary for hotel guests only / Daybeds & cabanas are available to the public upon reservation. HOURS: Pool hours are 6AM - 8PM Food service is available: Mon - Wed 11AM - 5:30PM & Thurs - Sun 11:30AM - 6:30PM * Hours are subject to change based on weather, capacity, and special events. Beverly Wilshire, Beverly Hills A Four Seasons Hotel Exclusive luxe and royal setting in the heart of Beverly Hills. This sophisticated Mediterranean-style pool and whirlpool, provide a serene escape from hectic city norms. Try their re-energizing shot glass smoothie or their delicious Chef’s Famous Lamb Sandwich for lunch. ACCESS: Pool exclusively for guests | Cabanas are available for purchase upon reservation. HOURS: The Pool Bar & Cafe serves refreshing alternatives to the traditional poolside menu, available from 8:00AM to 5:00PM. Got a shimmering champagne-hued highlighting powder? Chances are you are probably using it to highlight your eyebrow bone and the inner corner of your eyes. Use your powder to multitask; it can be effective at sculpting stronger cheekbones and elongating the face. To contour, apply the formula (pearly shades for pale skin tones, golden colors for olive or deep complexions) on the top of your cheekbones, down the bridge of your nose, and along the Cupidâ&#x20AC;&#x2122;s bow (the lovely upper lip area) for a gorgeous candlelit effect. Try: Bobbi Brown Shimmer Brick in Pink Quarts or Bobbi Brown Shimmer Brick in Bronze To make your eyes pop: apply black waterproof eyeliner pencil between your lashes. Finish off with a was of gold hue on your lids. Try: Bobbi Brown Shimmering Sands Eye Palette Polish up your lips: Get the perfect effortless tousled make them waves: by spraying your hair with a extra juicy, texturizing spray and rough dry it. summer-must Try: Bumble With a 1 1/4 inch - have pop of curling iron very loosely wave your color. hair creating more of a bend than Try: Bobbi a curl. Finish with a mist of strongBrown Sheer hold hairspray like Lâ&#x20AC;&#x2122;Oreal Paris Lip Colors Elnett. Whether you are headed on a beach vacay or volunteering as a lifeguard at your local pool this summer, these beauty essentials will keep your skin glowing from head to toe. Create a natural tan: show off your best, most natural-looking color by moisturizing with Jergens Natural Glow, or for an instant super tan try new Instant Sun Tanning Mousse. at hotels worthy for kings and queens of travel at these internationally recognized destinations. elcome to the most entertaining Fashion Film Festival in the World! The Mercedes-Benz Bokeh South African International Fashion Film Festival is one of the most creative and inspiring Fashion Film Festivals globally. The festival brings together creatives in the Film, Fashion, Artistic and related technical industries to celebrate their craft twice a year. Mercedes-Benz and Cape Town Fashion Council, again supported the Bokeh 2015 festivities. The festival, which took place over two days and two nights, was hosted at the luxurious 15 on Orange – African Pride Hotel in Cape Town, highlighted, Cape Town, a city that is already a top destination for fashion shoots and a prime location for international film crews. Best Music and Sound Design The festival featured esteemed artist Catherine Timotei’s LOVE ZA BUY ZA – THE GOOD DRESS pieces! Her work was featured in the Magents fashion BY SHOESTRING PRODUCTIONS film being shot at the festival. Founder of the Mercedes-Benz Bokeh South African International Fashion Film Festival, Adrian Lazarus is a Cape Town local who has travelled the world pursuing his love of Fashion Films. Originally a producer, Adrian moved into the directing arena 12 years ago. Inspired after his fashion film, Steam 1886, which won awards at both the La Jolla and Miami Fashion Film Festivals, he decided to create an international event to put Cape Town and South Africa on the fashion film festival circuit. Employee Satisfaction is Crucial for Success! By Eric Beans | CEO of Texting Base Inc.
Take a good look at the 3 categories above and ask yourself if these apply to you as an employee. Perhaps managers have employees whose careers on the edge of doom because of one or all of these three factors. The challenge business owners and leaders in the workplace face with their employees is that when they leave, they take their technology, clients, and secrets with them. Attrition is estimated to cost up to 2.5 times an annual base salary! Employee satisfaction should be a huge concern for owners and managers. The outfit (the employee) needs to match (your company). Management, a lack of work/life balance and scarcity of employee opportunity for advancement are all as important as the paycheck that they are earning and all make a huge difference. We all know that if you treat your clothes with the right care, they will last a long time. If you keep that same mindset with employees, they too will last longer and stronger! There are literally thousands of attractions in Thailand to amuse travelers from across the worldWonder with ease with a few helpful tips from our travel expert, Christine Andreu. Sample Itinerary: If you enjoy scuba diving, my recommendation is that you plan this first from home, and then consider the rest of your trip. At the airport, we were able to book our Tiger Temple tour, our 3-day riverboat trip, and at the hotel, we booked our Bangkok temple tour. For all of the tours and trips, a chauffeur picked us up and gave us a personalized and professional perspective of the area. Travel Tips: There are so many sights and experiences in Thailand, but you must go with an open-mind! The food is exotic yet delicious. Be prepared to taste some interesting flavors and textures, while remembering that you should always finish it off with one of Thailand’s delicious fresh fruit smoothies. The people are open and kind; this is a cultural phenomenon, don’t feel that they are befriending you to take advantage of you. Though of course we always travel modestly, leaving the bling-bling for the nightlife and not for daily excursions. Shopping Tips: If you enjoy relics of the old world, buy them in Thailand while you can! Thailand boasts souvenirs that are equivalent to quadruple priced goods that you want but feel guilty for buying. Stamp of Approval: Our trip was extraordinary! We spent 5 days in 3 cities and loved every minute! If you haven’t visited Thailand, then move it to the top 5 of your Bucket List! MUST SEE LIST! A guide to discover THAILANDâ&#x20AC;&#x2122;S hidden treasures! top of your bucket list! At the Tiger Temple you will experience the Buddhist monastery that is a wildlife sanctuary to awe inspiring tigers as well as other rescued animals. Make sure to ask about seeing the cub tigers! There are no words to sufficiently describe the beauty experienced Elephant Safari, so we wonâ&#x20AC;&#x2122;t try! $60 per person, you will enjoy the gorgeous sights, sounds, shopping and local culinary specialties while enjoying this magical floating ride. If you have a few days to explore, the riverboat stay will give you sights and sounds will make you will feel like a local, while you are waited on like royalty. We stayed on a riverboat for 2 nights.